Home » Blogs » lgrandy's blog » Who was Nehemiah Beckwith? But I was having a hard time determining Nehemiah’s assumed Loyalist connections, which I found mentioned in some articles but not others. I was not finding him on any lists of New Brunswick United Empire Loyalists or in The Loyalist Collection. As it turns out, Nehemiah Beckwith was a actually a pre-Loyalist, or rather, a Planter. I first found a mention of Nehemiah’s pre-Loyalist status in an entry from the UNB Archives catalogue about his descendent, Elizabeth Beckwith Hazen. It was not until I stumbled across an article by Lilian M. Beckwith Maxwell that I found the information I was looking for, although sadly she did not cite her sources. Maxwell’s article, entitled “The First Canadian Born Novelist” is about Julia Catherine (Beckwith) Hart, daughter of the elusive Nehemiah Beckwith, who at the age of 17 wrote “St. Ursula’s Convent or The Nun of Canada”. Nehemiah Beckwith was born in Lyme, Connecticut in 1756, the son of Samuel and Miriam Beckwith, who migrated in 1760 from Connecticut to take up former Acadian lands in Cornwallis, Nova Scotia. Further information can be found in Cornwallis-related materials in The Loyalist Collection, such as the Nova Scotia Township Records, and Planter material held at Acadia University. There is also genealogical information regarding the Beckwiths held at UNB Archives (collection MG H 104). “A View of His Majesty’s Brigg Observer, Commanded by Lieut. 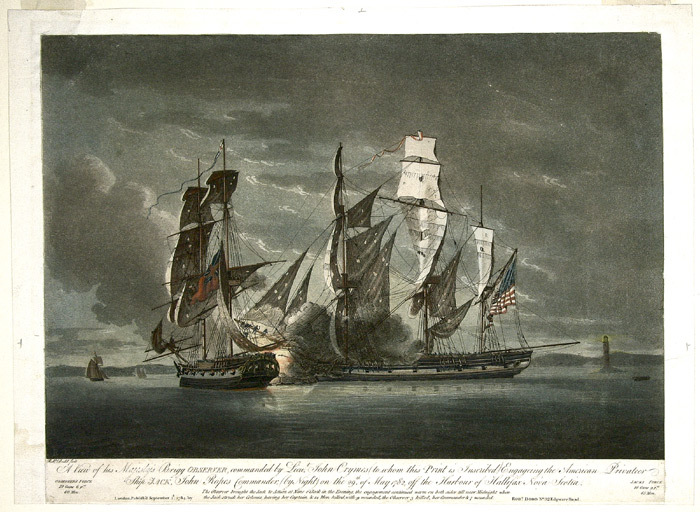 John Crymes Engaging the American Privateer Ship Jack, John Ropes (commander), by Night on the 29th of May 1782, Off the Harbour of Halifax, Nova Scotia”. Nehemiah continued to live in Cornwallis until the age of 24. After the outbreak of the American Revolution, Nehemiah found American privateers were paralyzing his attempts at trade in Nova Scotia, so in 1780 he moved to New Brunswick, acquiring one half of lot 78 from Joseph Dunphy in the Parish of Maugerville where he took up farming and ship building. There, Beckwith found himself working with many prominent Loyalists. He is mentioned in documents of the Loyalist Edward Winslow. The ships built by Beckwith carried Loyalists up and down the Saint John River. The story is further told in “Glimpses of the past: history of the river St. John, A.D. 1604-1784” by W. O. Raymond: “Mr. Beckwith was quite an enterprising man in the early days of New Brunswick. He was the first to attempt the establishment of regular communication by water between St. John and Fredericton, and for that purpose built in August, 1784, a scow or tow-boat to ply between Parrtown and St. Anns. A little later he built at Mauger's (or Gilbert's) Island a ship called the Lord Sheffield, which he sold on the stocks in May, 1786, to Gen'l Benedict Arnold. A Memorial of Nehemiah Beckwith, read 19th July 1788 and ordered to “lie on the Table” (which means to begin consideration in the British usage), documents Nehemiah’s plea to the Legislature to release him from debts, most likely incurred from Nehemiah’s bad business with Arnold. 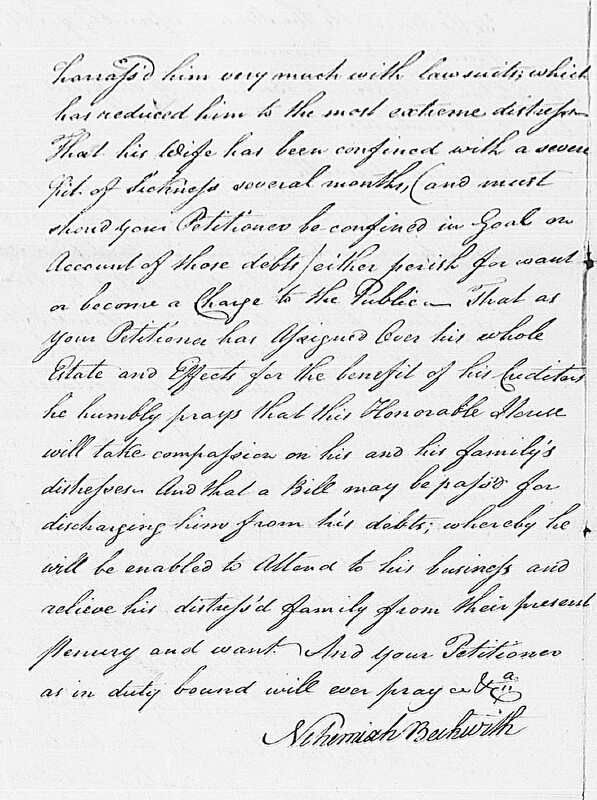 Petition from Nehemiah Beckwith of Sheffield asking that a bill be passed discharging him from his debts. We are not sure what happened to Nehemiah’s first wife, Molly Stickney, but in 1790, Nehemiah married Julie-Louise Le Brun de Duplessis (1774-1863) in Fredericton, who had come with Thomas Carleton, Lieutenant-Governor of New Brunswick (in office 1786-1817), as French governess and companion to Miss Carleton, so perhaps the first Mrs. Beckwith did perish from want! Nehemiah must have recovered financially because sometime around 1790, he built a house in Fredericton on the south side of King Street, the third lot in from Regent Street. Next week . . . learn more about the storied generations of the Beckwith family. Christine Lovelace has a MA in Records and Archives Management, and is an Archivist with UNB Archives & Special Collections. Thank you very much for engaging in the discussion! We love to gets comments.